Buddha’s Blend was recommended to me one day when I was in the DavidsTea store and wanting to smell some teas (as one does). I asked the sales representative for some recommendations and she must have pulled down like twenty different teas for me to waft towards my nose. Buddha’s Blend intrigued me because it’s a white and green tea blend. Plus it has such beautiful floral notes and big (very obvious!) hibiscus flowers that just add another layer of delicacy to the tea itself. Buddha’s Blend consists of: white tea, green tea, jasmine pearls, white hibiscus blossoms, natural and artificial flavouring. The dry tea has this amazing floral taste (from the mixture of jasmine and hibiscus, I would assume), but it also smells like peaches and pears, which is interesting to me because those ingredients are nowhere to be found on the ingredients list (unless it’s part of the “natural and artificial flavouring”). It is a very beautiful tea though, the mix of ingredients is lovely to look at! 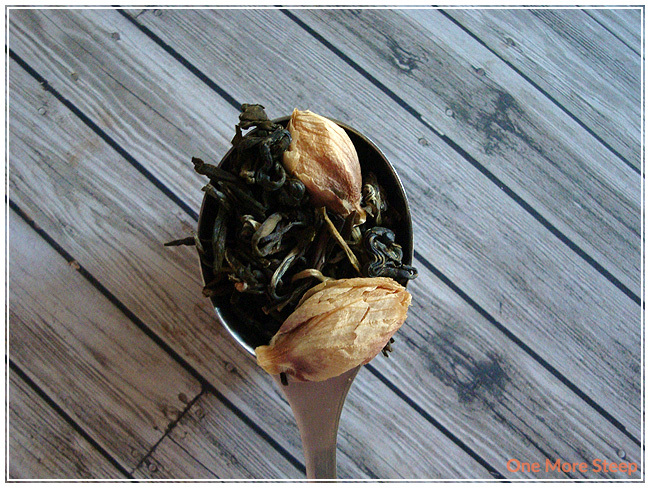 DavidsTea recommends steeping Buddha’s Blend in 80C (176F) water for 2-3 minutes. I opted for closer to 2 minutes since it’s so easy to over steep white teas and end up with a bitter cup. If you’re steeping a tea blend and there isn’t any guidelines for steeping, always opt to steep for less time because you can always steep it longer (but you can’t turn back time). Buddha’s Blend smells amazing. It doesn’t smell as strongly as a juicy peach or pear (like it did in dry leaf form), but it’s still there. It smells fruity and floral with underlying notes of sweetness. Buddha’s Blend steeps to this lovely pale yellow colour and it has such an inviting fragrance! On first taste, I can taste the jasmine for sure, the floral taste of jasmine is so very present and it doesn’t taste like peaches or pears (which is a bit of a disappointment. 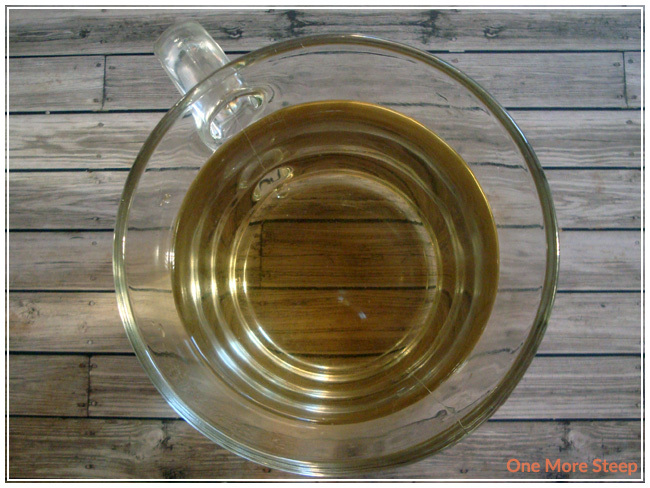 The tea base itself is a bit lost in the blend of ingredients, although there is a mild astringency to the end of each sip. 2 minutes may be a bit too long for this blend, despite it being on the low end of the recommended steeping time. I tried steeping a fresh spoonful of Buddha’s Blend for around 90 seconds and the astringency is gone in the taste of the tea. There’s also more obvious tea notes in the cup that was steeped for only 90 seconds in comparison to the one steeped for the full 2 minutes. It’s a tasty cup of tea! Buddha’s Blend tastes like floral water for steep #2 (for the leaves originally steeped for 90 seconds) and it’s bitter. I would say that Buddha’s Blend is only good for one steep. 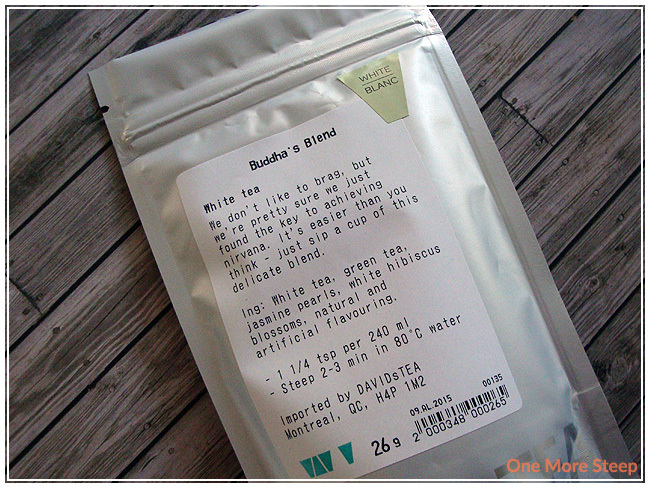 I thought that DavidsTea’s Buddha’s Blend was just okay. It makes for a fairly pleasant cup of tea – if you don’t over steep it and it’s unfortunate that the directions say to steep for 2-3 minutes when I found steeping for 2 minutes resulted in a sub par cup of tea. Overall, the taste of the tea is good if you don’t over steep it, and the dry tea smells amazing. I just wish the flavours of peaches and pears was more present in the tea itself after steeping. There’s a slight sweetness to the tea that I enjoy. I would have another cup of this tea (which is a good thing because I probably have about 20 more grams of it), but it probably won’t become a staple in my tea stash. It’s a little finicky in the steeping times, and while it smells delicious, it doesn’t do well for resteeping and it doesn’t taste as good as it smells which lends to (bitter) disappointment. I truly am sorry you didn’t enjoy Buddha’s blend. I have been brewing it for 2 1/2 minutes at 185 F. I sweeten it with a touch of raw sugar also. However I usually steep a smaller quantity than recommended per pot or cup. I find it to be one of my favorite teas lately!!!! Luckily there’s so many teas out there to try and to love! 🙂 There’s always something for everyone.